Once you start down the path of Kon-Tiki, forever will it dominate your destiny! From the 8th to the 10th of March the Cape Town Kon-Tiki managed to unite thousands of children, youths and adults from around the peninsula at the Zandvlei Sea Scout Base. For the 39th time, teens under 18 years old competed to build a raft, launch it on the water, and live on it for 24 hours! 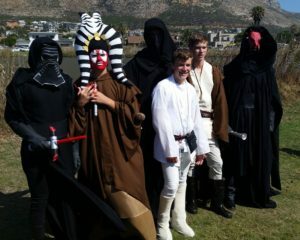 This years’ theme was Star Wars and many galaxies were represented once the rafts were afloat. Once again the creativity and skill of the young Scouts and Guides was put to the test – both on and off the water. The rafts that were built had to have a kitchen, separate bathroom, and sleeping quarters. If there were boys and girls on board there needed to be two bedroom areas. Once the rafts were launched the Scouts had to live on them for 24 hours and fulfil a number of challenges. They were given wood, nails, paint, and tools and had to build a go-cart that mimicked Star Wars X-Wing Fighters. The next day they needed to transport the go-cart to the shore with a canoe after which a race ensued. They also prepared dinner and breakfast for the judges in their floating kitchens. Dinner consisted of chili con carne, naan bread and salsa. Breakfast was chai tea with a steamed cake decorated to look like princess Leia. Additionally, they built an Imperial Walker out of wooden staves and attached it to the front of the raft, and purified water in a self-made moisture tower. The Cubs, Scouts and parents on shore took part in the Fringe activities. This required the Force to be with them as they raced against each other in a range of competitive ventures. There was a volleyball tournament, obstacle course, tug of war, knee boarding race, cross country event and an orienteering activity that took them all around the Sea Scout Base. As with all events, food cannot be excluded, and the Scouting parents took part in a cooking competition with sumptuous results. The Cape Kon-Tiki Adventure was started at Zandvlei in 1978 by Darryl McEwan. Originally it was purely a raft competition whereby teens had to live on the raft for 24 hours. Today the competition has grown exponentially and with the addition of the Kon-Tiki Fringe, even the crews on land get to exert their „competitive spirit‟! The Fringe competition keeps Scouts at the base actively entertained while the rafts are on the water, and proves to be more and more popular each year.